I love built-ins. It’s probably the one thing they take out on Fixer Upper that I sometimes cry over … okay, not really cry, but I’m thinking to myself, Why? They were white and could be so cute! Of course, Joanna does something awesome with that space and then I go, Oh, THAT’s why. Got it. Yep. I love that. Because, ya know … Joanna Gaines. Our 1960s ranch had zero built-ins, though, so I was working with solid walls when we moved in. Still, I kept seeing all these old, charming homes with beautiful built-ins and floating shelves and finally had an a-ha moment one day and said, “Hey, I can build those.” So I did. 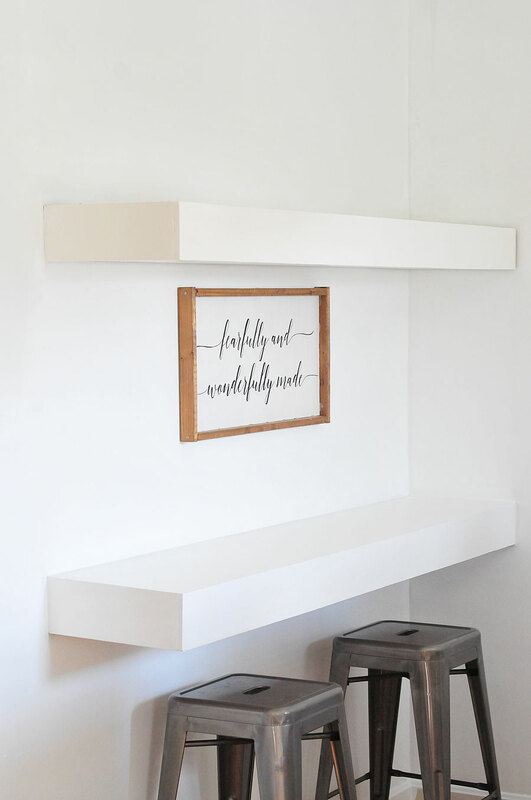 Ten years and one child into living in our home, I built some Shanty-2-Chic shelves for our dining room based on this bar that I saw on an episode of Fixer Upper, And. I. Love. Them. 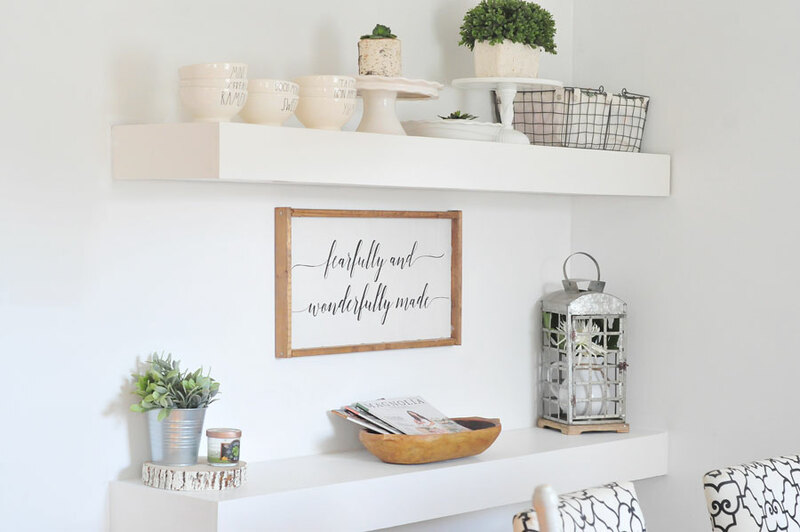 The thing about built-ins and shelves, though, you have to know how to style them. That took me about two years to figure out, SO here I am having tried a ridiculous number of things before finally finding the process that has worked every single time to style my shelves. If you missed my last post on the dining room update, head here to read all of the details on it. One major step in that was painting the room white so the shelves really do look built in as opposed to just these random freestanding (er–hanging) chunky blocks on the wall. Once that happened, the color scheme all came together, and I knew exactly what I did and did not want to put on these shelves. 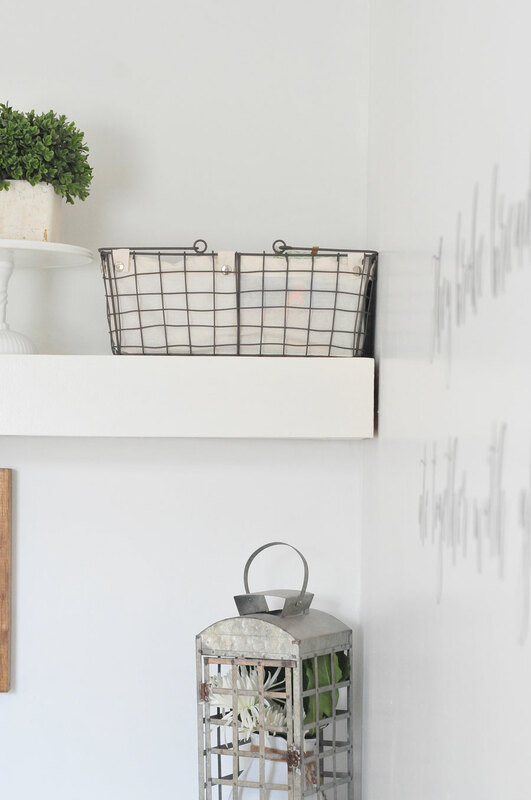 There are a few guidelines that have helped me process through styling shelves so they don’t look messy and cluttered but also don’t look too put together, if you get what I mean. 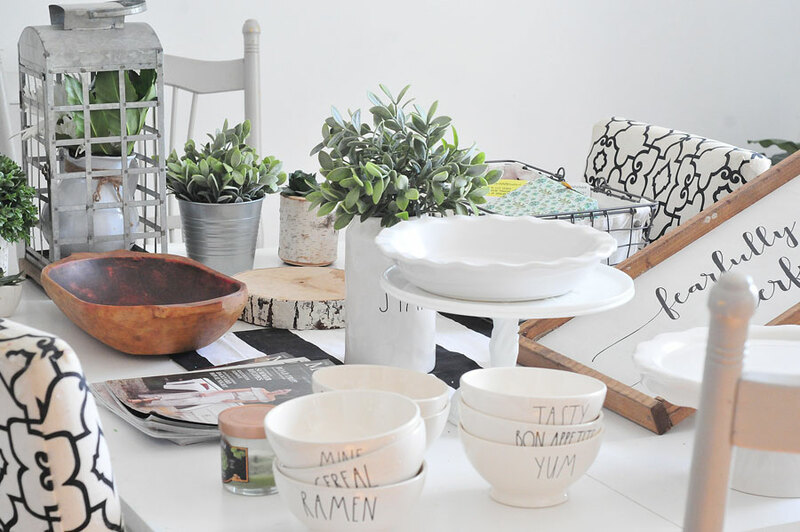 I love that rustic farmhouse look, and I like my house to feel lived in (but neat). 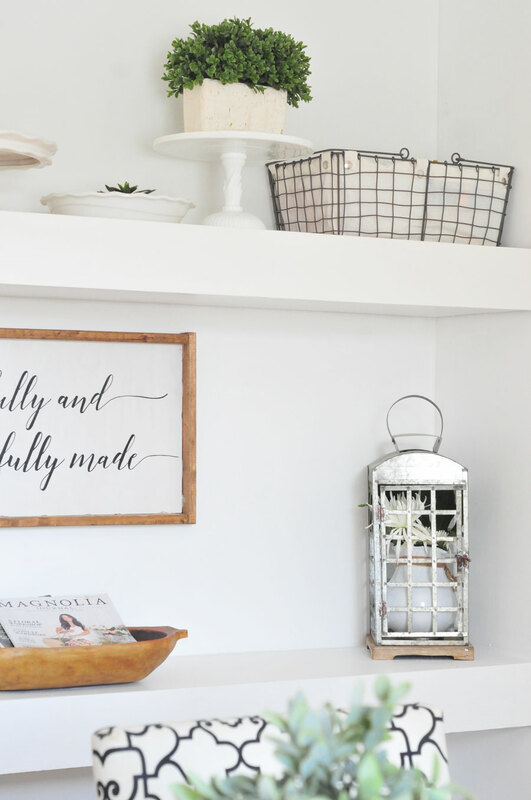 That’s a fine line to walk, so here are my best tips and tricks to styling your shelves and built-ins. Before you do anything, you have to identify the space you’re going to be decorating. Do you have a color scheme laid out? Any inspiration photos? How many shelves do you have to fill? 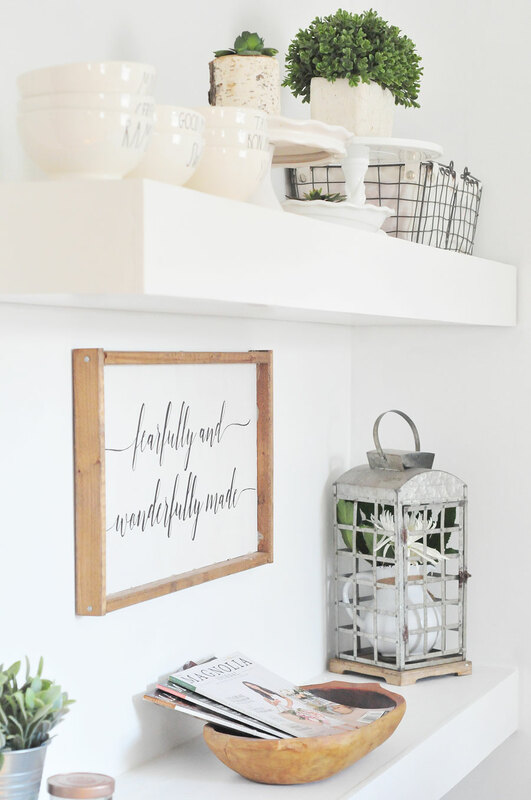 These are all good things to put together for a mood board so you have a good idea going in of what you’re going to be doing with the space, or at least the overall feel you want the shelves to have and add to the room. 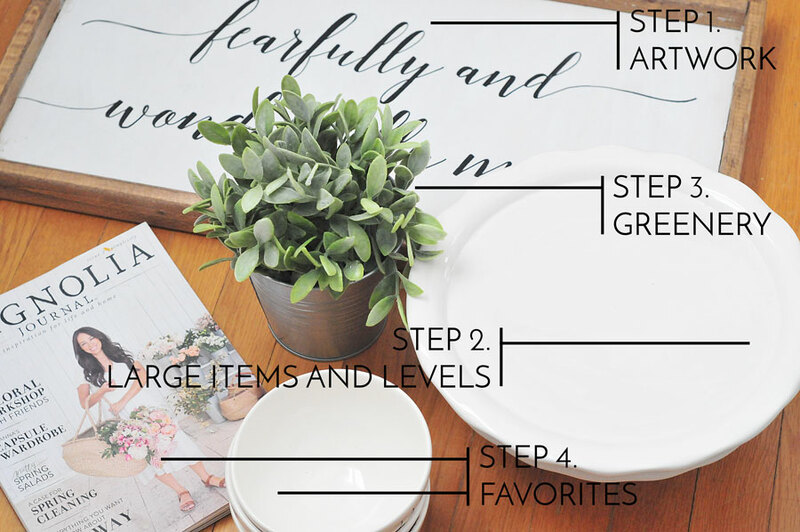 Once you know the direction you’re headed visually, here are four practical steps to styling your shelves. Step 1. Place your artwork. I only had one main piece that I wanted to hang (available here) on the wall for these shelves. Depending on your space, you may have more than one. 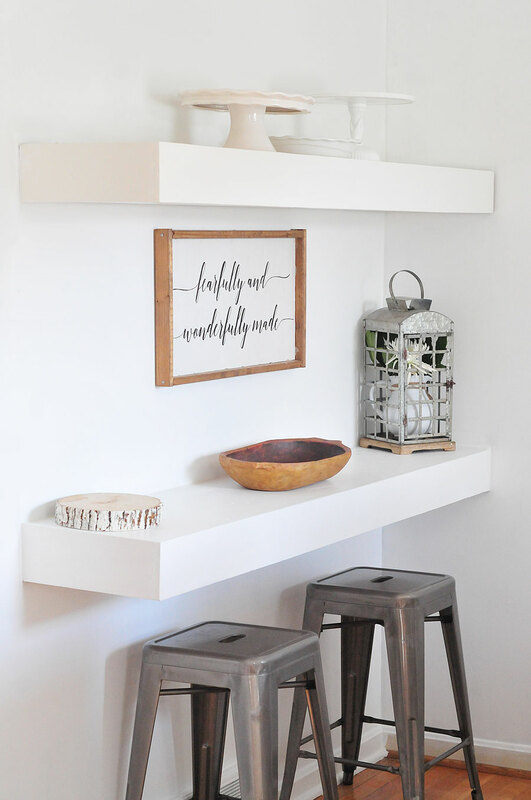 Artwork is great stacked and layered, hanging on the wall and even leaning up against the wall, so don’t feel limited by hanging one piece in the center. I love the look of two large pieces intersecting on the wall — remember, the possibilities are endless. Step 2. Add large items and levels. The last thing you want is for everything to be the same height. You also don’t want everything to be the same thickness. Look through what you want to use on your shelves, and pick the thickest, tallest and chunkiest items to place first. 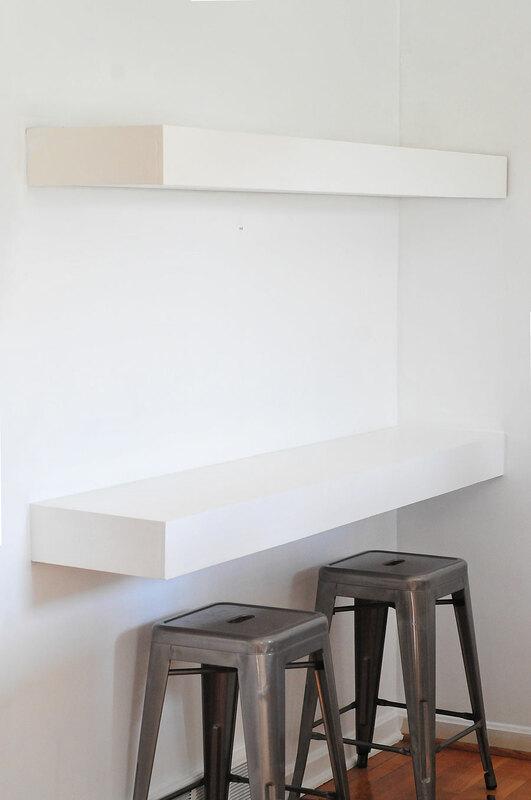 Space them relatively evenly on your shelves to add some dimension. These will help to break up some of the smaller items we’ll add later. Cake stands are a great way to do this. Stacking items is another great way. Antique scales are perfect, too, or stack some books! There are limitless ways to add levels to your styling. I used my cake stands and a tree slice as level pieces for these shelves. The lantern and trencher were both really chunky pieces that needed plenty of space so the shelves didn’t feel crowded. I actually married Step 2 with Step 3 on the lantern. Especially in a white room and especially during the summer (or spring or winter or fall) greenery makes a huge statement. This could be anything from a large magnolia wreath to a $2 Ikea plant (yep, that’s what I used). I put fresh flowers in the lantern and added some faux succulents and a boxwood to my cake stands as toppers to bring a little color to the shelves. If you’re using glass jars, fill them with some sort of greenery or even cotton stems. If you love succulents, line them along the shelves using varying sized containers (think candlesticks of differing heights). A little green goes a long way. Step 4. Add your favorites. This is my favorite part because it’s where you get to take all those leftover items and spread them out on your shelves. 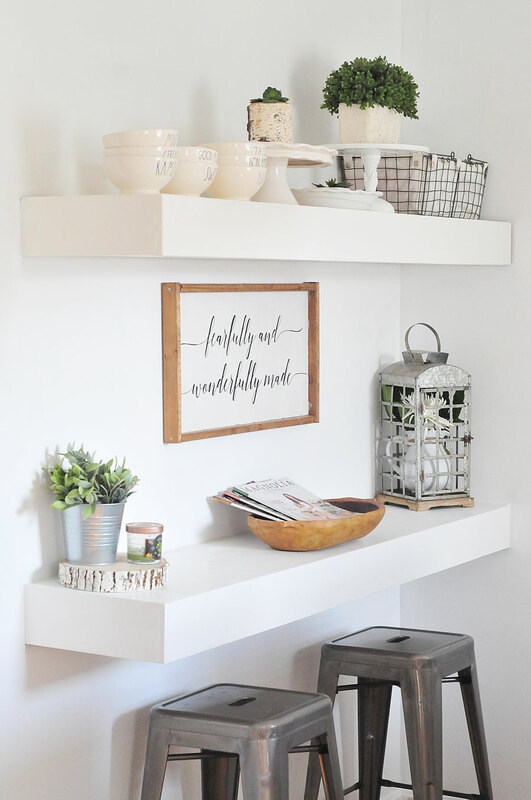 Some of my favorites for these shelves were a little candle that smells like fresh herbs that I picked up at HomeGoods a lifetime ago, my Magnolia Journal magazines and my Rae Dunn bowls. Whatever those things are that you love and really want to add in, space them out or stack them in sets of three. After you’ve finished, step back and take a look. You may have to make some minor adjustments, but you’ll have a really good sense of what you love and what you don’t love about the shelves. I had a basket that’s kind of our catch-all for stamps, charging cords and bills that I decided to add at the last minute to the top shelf, and it works! I just had to space out some of my levels and other large objects a little further. You may find that you have too much to go on the shelves, and that’s fine. You don’t have to put everything up there — just what you love looking at! Here are my shelves completely styled, and I couldn’t be happier. 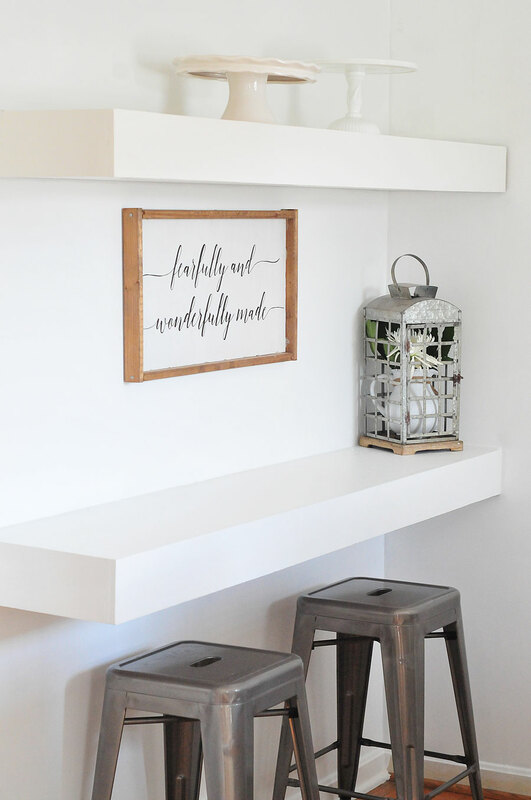 They finish off the dining room look perfectly, and display some of my favorite things (homemade and otherwise) while still being functional for extra seating in the dining room and holding some of those things that don’t have a home elsewhere. 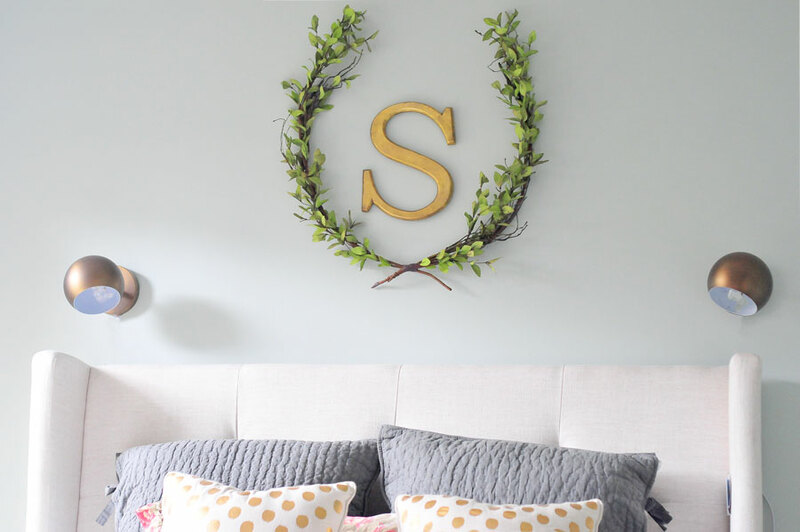 If you try this out, I’d love to see how you end up using these tips to style your own spaces by tagging us in your photo or posting a comment below! Happy Friday, friends! Great ideas! There is a real knack to doing it right! It does take practice! Thank you, Helena!!! It’s so true — it takes so much practice, and it’s taken me so many failed attempts to get it right! Thanks for checking out my post!